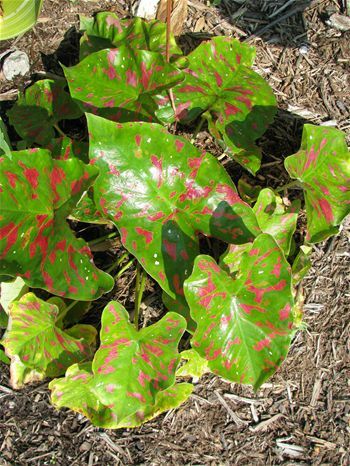 Vibrant, but certainly NOT toxic, the shiny, dark-green leaves of this Caladium are splotched with red and reflective in bright light, making them look waxed. *Plus .15 royalty. Colorful, heart-shaped leaves can be very effective when planted in a big sweep. Use as border plants for splashes of color. Shorter varieties combine well in mixed planters and hanging baskets with Begonias and Fern.